Looking for a delicious dessert to make this season and over the holidays? The BEST ever vegan apple crumble is just like the classic version, but highly nutritious, naturally gluten-free and butter-free! Oh… hello fall season! I’m super excited to start the baking season all over again, and the first recipe that jumped in mind was this delicious apple crumble. I’ve been making this vegan apple crumble for YEARS, so I thought it was time to update the original recipe post published in 2014. 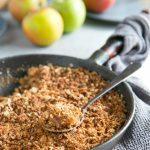 This recipe has been tested, improved and approved exhaustively, to bring you the BEST vegan apple crumble you’ll ever make. I’m a massive apple fan, and right now the farmer’s market is PACKED with the most delicious varieties out there. From the tart Granny Smith to the sweet Honeycrisp, there’s a different apple for every day of the year, and even more *there are actually more than 7000 apple varieties in the world*. And as much as I love biting into a juicy apple, a heart-warming dessert is definitely my favorite way to make the most of apple season. 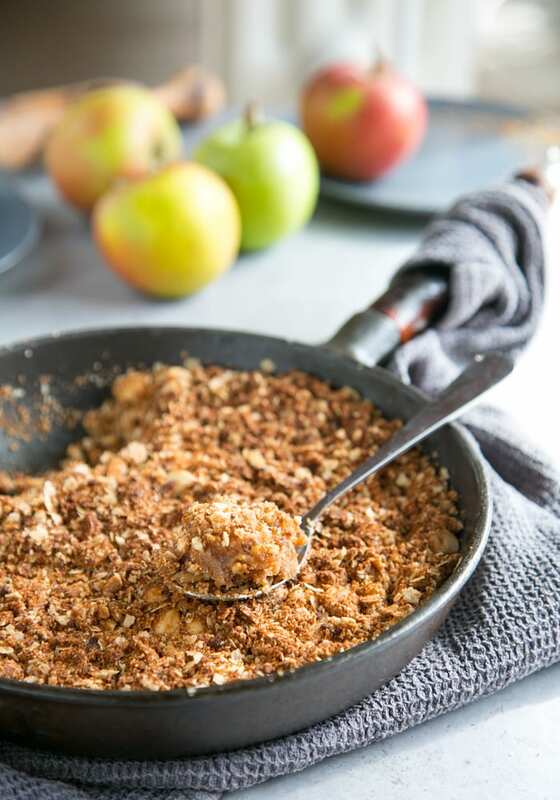 This vegan apple crumble features a crunchy nutritious topping of toasted hazelnut and almond flour and a deliciously warm spiced apple and cranberry filing. It’s my kind of dessert. FULL of flavor and naturally healthier, with a perfectly balanced combination of sweet, tart, crunchy and spiced flavors. Plus, the butter-free topping with added nuts, turn it into an energy-packed treat to easily fuel you up during the cold season! I mean, what’s not to love? The recipe for this vegan apple crumble is super easy, and requires less than 10 ingredients: apples, cranberries, coconut oil, demerara sugar, almond flour, hazelnuts and a few favorite spices (I use a combination of cinnamon, ginger and nutmeg). Traditional crumble recipes call for tons of sugar, flour and butter, but this vegan apple crumble has a reduced amount of sugar, and no flour or butter in sight. Instead, I used almond flour and coconut oil, and the result is totally amazing! 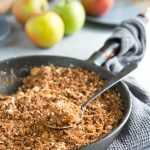 Also, you can use your favorite apples, as long as you choose a crisp I usually go for a mix of Granny Smith and Honeycrisp apples when making this delicious crumble. This Vegan Apple Crumble is super allergy-friendly (peanut-free, dairy-free & gluten-free), so it would make a great dessert for the upcoming Thanksgiving or Christmas parties. You can easily make a large cake-sized version as featured here, or mini individual portions for a more sophisticated dessert. So, if you’re looking for a heart-warming dessert to make all season long, look no further. This healthy gluten-free vegan apple crumble actually tastes SO good that’s even better than the classic version. The BEST ever vegan apple crumble is just as delicious as the classic version, but highly nutritious, naturally gluten-free and butter-free! In a large bowl, mix sliced apples, cranberries, sugar, cinnamon, nutmeg and ginger powder. Distribute the mixture evenly in a 9-inch cake pan or cast iron skillet. In a small bowl, mix together chopped hazelnuts, almond flour, rice flour, demerara sugar, cinnamon, salt and coconut butter. If the mixture looks too wet add in 1 tbsp of rice flour. Distribute the topping mixture evenly all over the apple filling. Bake for about 30-40 minutes, or until the apple filling is soft and the topping is crunchy and golden-brown. If the top browns too quickly, cover with foil and continue to bake. Once ready, remove the apple crumble from the over and allow to cool before serving. Store leftovers in an airtight container in the fridge for up to 3 days. Originally published in December 2014, updated with new words in post, new photos and improved recipe. You may use only hazelnuts or sub half the amount with almond flakes, pecan nuts, walnuts or pistachio. Hey Jess! I’m so glad to hear you like the recipe! I don’t add water, I did try a different version of this recipe where the filling was briefly cooked over the hob and I did add some water in the mixture, however the filling comes out a bit soggy, so I went back to this original version where the filling is not cooked beforehand and the result is so much better! Hi. Would it be possible to have the recipe for the old version of the apple crumble? Hi Esther, there was a bit of a mixed up with the recipe when I updated the post, it’s all sorted now and the old recipe (triple tested just to make sure) is back on! Sorry to disturb Andrea… but I don’t seem to find that old version of the recipe 😏 Could you please send on this thread? Hi Esther, no disturb at all, I’m always here for you guys 🙂 The recipe has been updated so what you see on this page is the actual old&true version of the recipe! Let me know if you need anything else! Oh how delicious this looks. I absolutely love apple crumble. It’s one of my favorite Fall treat really. Can’t wait to give your version a try. Sounds very flavorful and sooooo good. 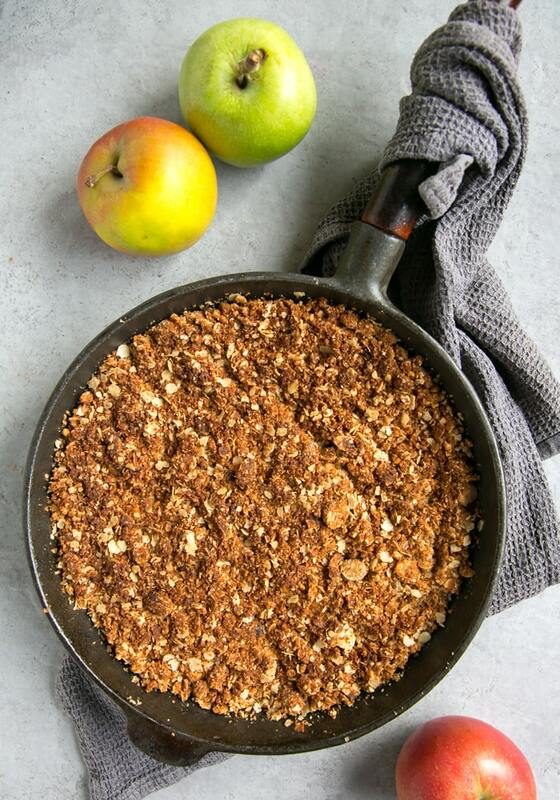 Now this is the way to my heart, crumble truly is my love language – and this one is amazing! This looks SO delicious and I love that it’s vegan. I also love your addition of cranberries. I bet their flavor blend perfectly with the apples. I absolutely love this vegan apple crumble! I am also the dessert provider for just about every Holiday! I have vegan, dairy free, gluten-free, etc. I am always looking for delicious desserts! I love the flavors and the crumble is perfect! My neighbor brought over apples yesterday and I made some caramel apples but now I need more recipes to use them up soon. I love apple crisp but I haven’t made an apple crumble. It has all the same flavors I love the most and I know it’ll taste great with ice cream. This Apple Crumble is calling my name! I would love a big bowl with some vanilla frozen yogurt. I’ve really been wanting to make a dessert with apples with all of the varieties in the stores right now. This will be perfect! Thank you for Sharing vegan version. Recipe looks so flavorful. Can’ t wait to try these. This looks so good – I bet I wouldn’t even miss the butter. I love the combo of apples you chose. Yum! The combination of spices is fantastic, just right to my taste. 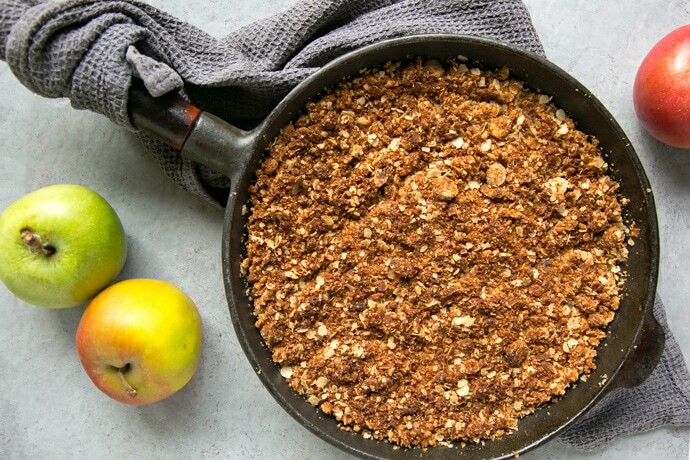 We dont do a lot of vegan recipes at home , hopefully will start with your apple crumble! I love that you’ve added cranberries to this to kick the flavor up even more! I bet the coconut butter is fantastic in this! Wow! What a beautiful apple crumble! I love the addition of the cranberries here and I really love that the recipe is vegan. This is perfect for Fall! This looks amazing! I found your blog via the #bibs shortlist – good luck! Thank you so much Tina! All fingers crossed for the #bibs2018 :)! Hello Petite, I tried this recipe with enthusiasm. Well it really didn’t turn out right for me but I’m eager to find out why maybe you could help: I used coconut flour instead of almond flour, I used walnuts and pecan instead of hazelnut but I don’t think that should have mattered. I also think I made too much topping and the apples were overcooked. The main issue though was that the topping did not stick together, it was so powdery that a few times it dried the back of the throat and we nearly choked lol. Could that be the coconut flour ?? Hi Nat, I’m so sorry to hear the apple crumble didn’t turn out quite right, I’ve had a similar issue not long time ago. I used coconut flour instead of almond flour and it came out crumbly and sandy and not holding together, so I recommend you try it with almond flour next time (I also suggest to add 2 tbsp of rice flour for a more compact result). I love your walnuts and pecan topping by the way, I can’t wait to give it a go myself! The topping was deliciously nutty and sweet and did not burn but mine did not become crunchy as a good crumble should. Perhaps some flour would help – gluten free if necessary. Perfect for the holidays! Thanks for sharing. Hi Phil, thank you SO much for your feedback 🙂 It really makes my day reading comments like yours! Hi. I am sorry, but your recipe doesn’t quite work as it should. I find that the ingredients for the topping weren’t enough and it is way to much sugar in it, which results in burning the top after 20 minutes in the oven. Hi Judit, thank you for letting me know. I’m a bit puzzled as it did work perfectly for me as you can see from the picture, maybe you can reduce the sugar if you think is too much and cover the crumble with foil while it cooks. But ingredients proportions are very similar to BBC apple crumble recipe ( although their version is not vegan).